Dawn of the Planet of the Apes is a remarkable achievement in combining traditional narrative filmmaking with digital performances, motion-capture technology, and animalistic storytelling. The Planet of the Apes series is a curious one as Rise of the Planet of the Apes was a surprisingly effective franchise revival leaving the door open to an eventual reimagining of the greater ape world. Here, with a mostly new cast and storyline, as director Matt Reeves takes over for Rupert Wyatt, Dawn reaches the apex of this human/animal story using immaculate special effects to bridge the cinematic gap along with survivalist themes. Dawn is one of the more thoughtful Hollywood blockbuster films in recent memory as this is through and through a story about the apes and their formation of an intelligent society. It uses hallmarks of Shakespearean works like family, betrayal, ambition, and leadership to evolve and explore human themes on the cost of war and survival, sublimely. It's firmly Caesar's film as Andy Serkis' seamless performance is the star while the human characters play second fiddle. As king of the apes, his decisions, conflicts, and decisions set and move the plot along smoothly. This time around, he's surrounded by a large group of human-to-ape mo-cap performances, all with their own fleshed out character traits and arcs. Reeves has injected nuanced, ambiguous flourishes, deftly managing interesting political allusions about the nature of prejudice, territorial conflicts, tribal mentality, and even gun control into the film. It's so grounded and pleasant in the depth and breadth of the ape story it tells. Human and ape behaviour is contrasted to examine morality and a collective struggle for piece quite well. We assume there's going to be a peace vs. war battle between the human leaders, played by Jason Clarke and Gary Oldman, but it's really the apes that go through the Martin Luther King Jr./Malcolm X style tug of war between Caesar and his lieutenant, the war mongering Koba (Toby Kebbell). The consequences of this violence and action are thoughtfully explored and realized with practical blocking and state of the art digital effects. The fluid yet minimalist script by Rick Jaffa, Amanda Silver, and Mark Bomback choreographs the relationships and group dynamics beautifully as the action and movements unfold to reveal the motives of the apes and humans (not too different from each other) eloquently and entertainingly. This plays out theatrically as the unfolding drama and interactions between species becomes more and more emotionally driven as we see the brutality and unpleasantness of violent conflict express itself. All this is all the more powerful as the interspecies bonds develop and human and apes identify with one another through the perils of self-awareness and intelligent thought. Dawn of the Planet of the Apes is so confident and assured in its filmmaking as Reeves packs numerous money shots of apes using weapons, riding on horseback, tanks, and going all out on attack. 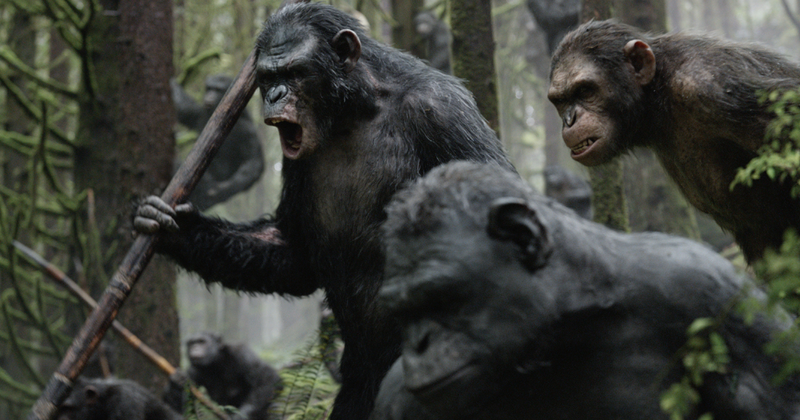 This action is balanced with dynamic character interactions and relationships from a sharp script that evolves the stakes from Rise of the Planet of the Apes, eschewing that film's convention and sentimentality for a more thorough examination of this evolved ape culture starkly contrasted with the inherent conflict of humanity. It's a gloriously visceral cinematic experience and even better sequel and extension of the Planet of the Apes saga.